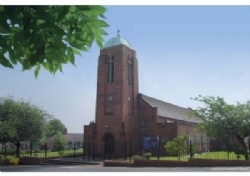 St John’s Church was built in 1892 and the Church was officially opened, and the first Mass celebrated there by the Bishop of Birmingham, Bishop Ilsley, on Wednesday 8th February 1893 at 11.30am. The Church was founded from the Parish of Goldenhill, where Fr Thomas Kenny had been Parish Priest for about ten years. 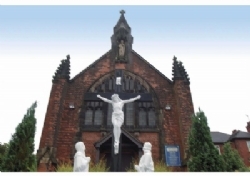 He worked together with Mr William Young Craig, a builder, surveyor, JP and former MP (he was MP for the North Staffordshire consituency from 1880 to 1885), to bring about the building of St John’s. Mr Craig was brought up in Haggerston, near Lindisfarne in Northumberland, son of a Scottish father, but had moved to Staffordshire in 1861 to manage Harecastle Collieries, and in 1891 was living at Milton House, Alsager. Although Mr Craig had been brought up a Presbyterian, he converted to the Catholic Church in the late 1880s. His correspondence with Fr Kenny reveal a man of great zeal for his newly found Catholic Faith. 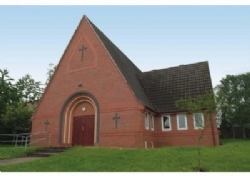 He felt such a great gratitude for his conversion that he determined to leave a lasting legacy to the Catholics of Kidsgrove by building the Church. The cost of the Church was £4,200, which including the cost of building the attached presbytery and a school building. William Craig died in Wrexham in 1924 at the age of 96. A new Parish Priest took over in Goldenhill once the new Church was opened in Kidsgrove and Fr Kenny became Parish Priest of Kidsgrove alone. Sadly he died only seven and a half years after the opening of the Church, at the age of 51. His funeral took place at St John’s on 22nd July 1900. The Catholic population of Kidsgrove at this time was quite low, remaining at only around 200 in the early part of the 20th Century, and rising to 600 in 1957. In 1932, a new school – the present school site on the The Avenue – was opened, and major renovations to the presbytery were completed. Many thanks to John Coates for researching the history of the Parish.